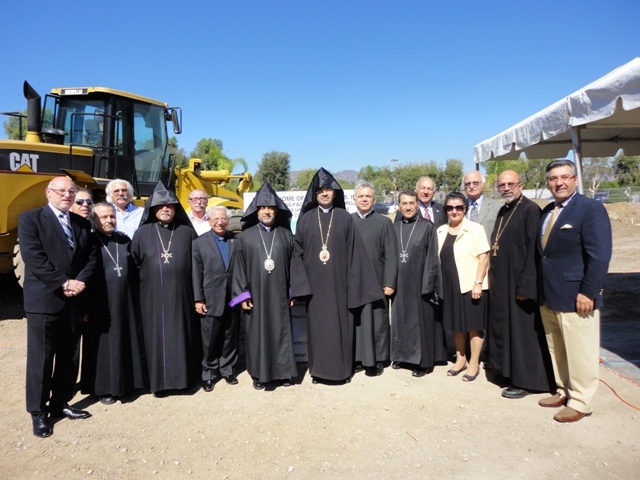 Revered clergy from the Southern California Armenian Community came together on Sunday afternoon, October 2, 2011 to bless the ground of Ararat Home Skilled Nursing Facility’s newest construction project. Known as “Phase III,” the project will provide an additional 58 beds to the 198 beds already in service at the Mission Hills campus. Western Diocese Primate, Archbishop Hovnan Derderian, Western Prelacy Primate, Archbishop Moushegh Mardirossian, Armenian Catholic priest Armenak Bedrosian and Minister to the Armenian Evangelical Union, Rev. Joseph Matossian took part. Co-Chairmen of the Construction Fund Raising Committee, Ron Nazeley and Berj Shahbazian welcomed the 40 attendees and provided details of the project. Ararat Home Board Chairman, Nazar Ashjian, Jr. who also serves as Co-Chairman of the Construction Committee with Joseph Kanimian, commented, “Ararat Home is for the whole community and is open to everyone.” Following the blessing of the ground, a reception took place in the Trustee’s conference room.